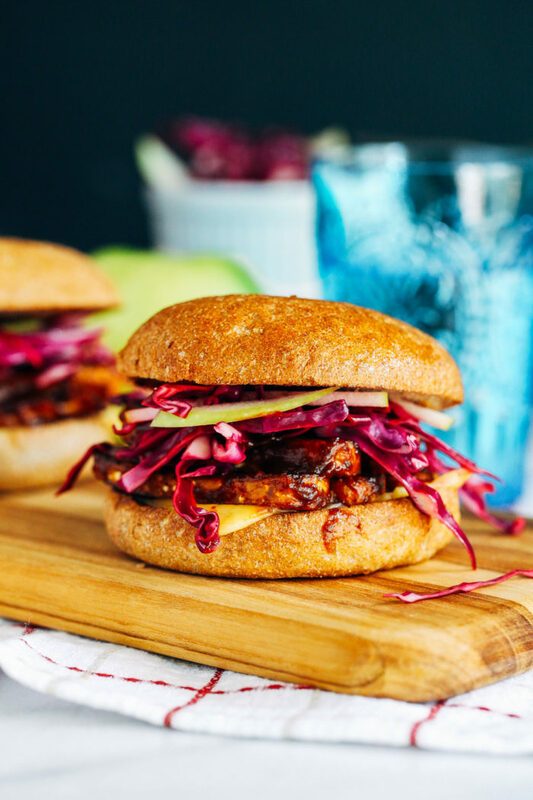 BBQ Tempeh Sandwiches with Tangy Apple Slaw- barbecue tempeh topped with vegan smoked gouda and a tangy apple slaw. The perfect summer sandwich! 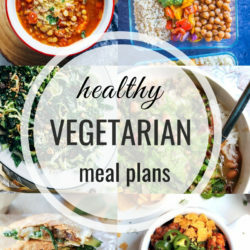 One of my goals this year was to go back and update some of my favorite recipes on the blog. I had no clue what I was doing when I first started this site so everything prior to 2016 is a bit of a mess. With almost 700 posts under my belt and a large portion of those being recipes that I consider favorites, it could take me a while. 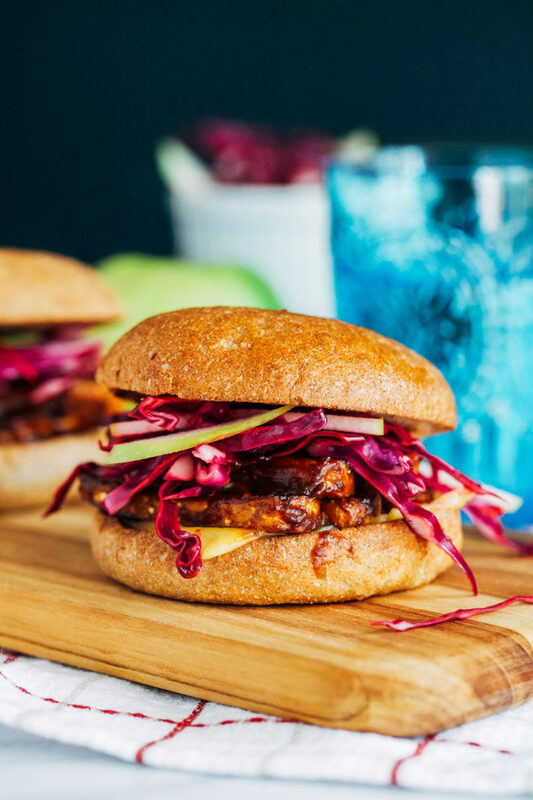 While it is a lot of work it’s also been fun to revisit meals I haven’t made in a long time, like these BBQ Tempeh Sandwiches. 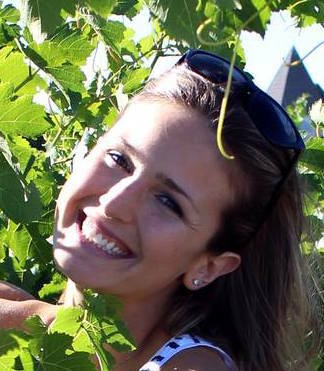 When I first shared them I had just finished Michael Pollen’s book and it sparked my curiosity on the wonders of fermentation. If you’ve never eaten tempeh before, it’s basically just a bunch of fermented soybeans lumped together in a square. I know it doesn’t sound or look very pretty but if it’s prepared the right way (i.e. smothered in your favorite sauce) it can be absolutely delicious. For this recipe I used homemade vegan BBQ sauce which I prefer for maximum flavor, but it’s not totally necessary. I’ve made them with store-bought BBQ sauce (Amy’s Smoky Maple) and they still tasted great. They’re just slightly better with the homemade sauce. The trick to getting the tempeh to absorb the most flavor is to heat the sauce beforehand. This allows it to permeate the tempeh so that it holds on to that barbecue goodness while you cook it. In addition to the poor layout of the post, one of the things that reminded me to update these sandwiches was Follow Your Heart’s new Smoked Gouda Slices. 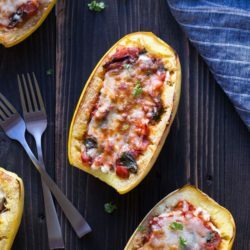 I had used smoked gouda cheese when I first made them and I knew their new plant-based slices would be the perfect way to make the recipe vegan. Turns out their gouda tastes just as good (if not better) on these sandwiches. I’m telling you, the tangy barbecue sauce paired with the crunchy apple slaw and smoked gouda is a match made in heaven. 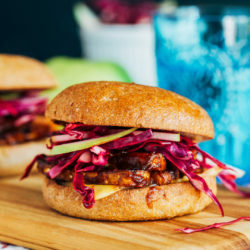 If you’re not on board with tempeh yet, these are sure to do the trick! In a small saucepan over medium-high heat, simmer the BBQ sauce for about 5 minutes, or until heated through. Remove BBQ sauce from heat and transfer to a shallow bowl or dish. 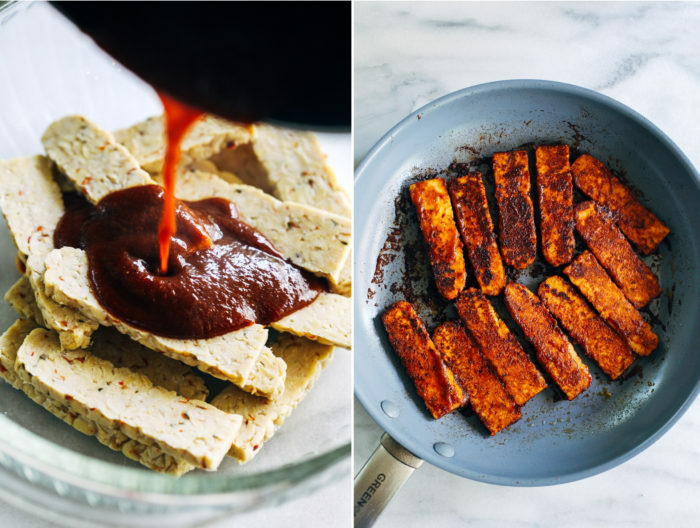 Place tempeh in the bowl and coat well with the barbeque sauce. 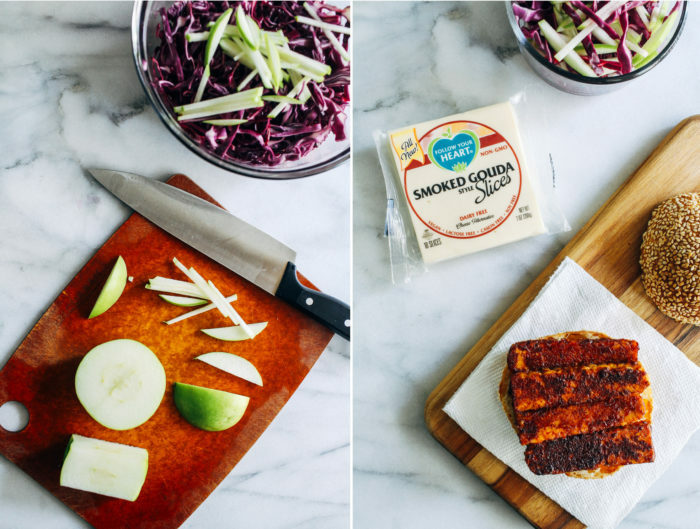 Marinate for about 10 minutes, while you prep the slaw. In a large bowl, whisk together apple cider vinegar and lime juice. Add the cabbage and apple and toss until evenly coated. 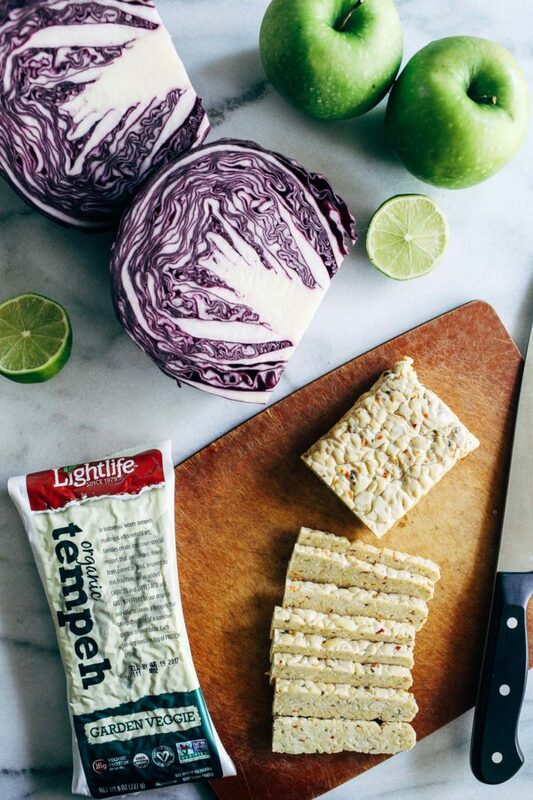 Refrigerate while you cook the tempeh. 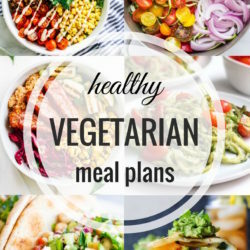 To cook the tempeh you can either bake it on a baking sheet with parchment paper (or a silicone mat) at 400°F for about 10 minutes on each side OR you can cook it in a non-stick skillet with a small amount of oil over medium heat for about 5 minutes on each side. Reserve the left over BBQ sauce in the bowl for serving. Place 4 strips of tempeh on each bun and top with remaining sauce and a slice of gouda. Broil for about 2 minutes so that the cheese is melted. Top with apple slaw, serve and enjoy! 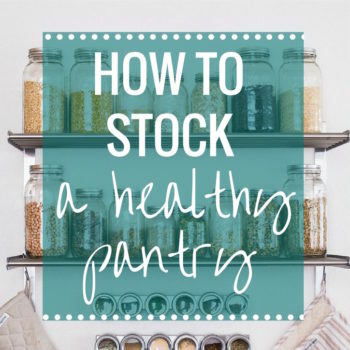 *You can also use store-bought BBQ sauce. Simmer 1 cup over medium-to-low heat for 5 minutes then continue to step 2 of the recipe. Pingback: Vegan Fast: Week 3 | Ponyboy's Two Cents!! 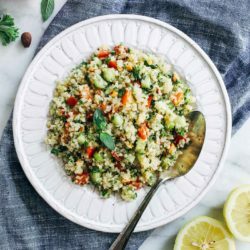 Pingback: One Year Vegan + What do Vegans Eat? Mmm that apple slaw sounds so good! I haven’t had BBQ all summer yet. What’s wrong with me?! I need to grill out some corn on the cob stat so I can feel like I’m doing summer justice haha. That is the absolute best vegan cheese!! We really don’t buy anything else anymore. I’ve been wanting to prioritize re-making and re-shooting my older recipes too – it’s such a great project, and it’s always nice to re-visit a tasty dish! 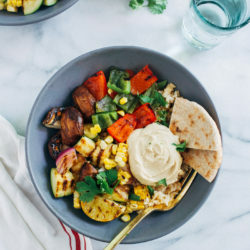 I’ve been asked by my friends on numerous occasions what tempeh is, and I’ve always been like, “mmmIdunno, I think it’s wheat and soy-based,” lol! So now I know…next time someone asks, I can tell them it’s fermented soybeans lumped into a square ;) Love this sammie, m’dear! It looks so flavorful!! 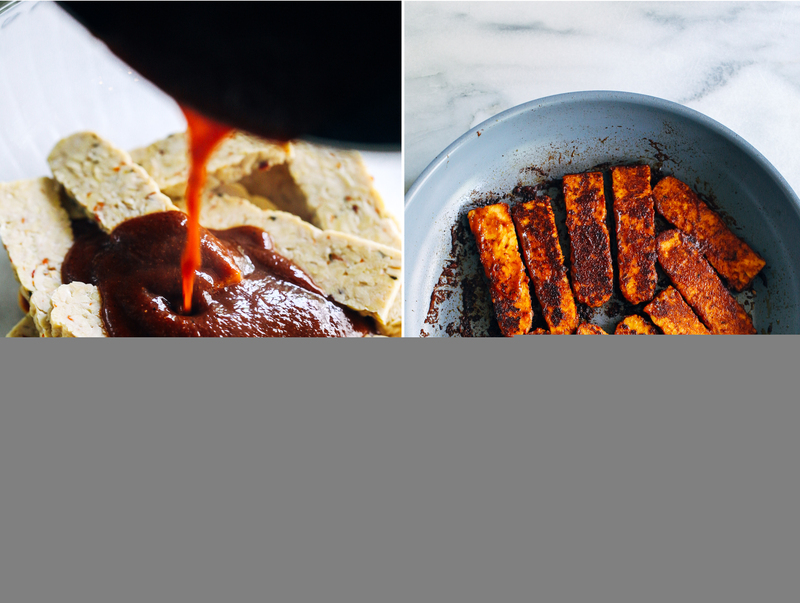 I’ve never tried tempeh before but it sounds incredible smothered in homemade BBQ sauce! That vegan smoked gouda and the slaw sound like the perfect way to top this off. I can see why this is one of your favorites! I love these sandwiches, and need to make them again soon! I think I need to call you out on saying that all of your posts prior to last year were a mess though…. No way lady! I totally know what you mean though… I cringe when I look at some of my older posts! I’ve bookmarked some of my older recipes that I love and need to reshoot, but we’ll see if/when I get to it!